A lot of people still use regular bins in order to get rid of organic products that they don’t need to use. If you are one of those people, then you may want to consider a composter. 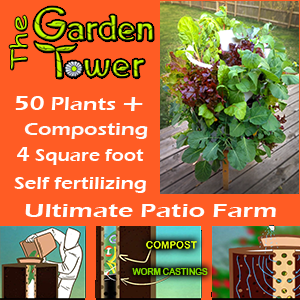 This is very useful, as it enables you to produce nutrients for plants in your garden. However, this often takes up a lot of space, which is something that not everybody has. This is where the Linkyo Compost Bin, which allows you to make compost right there in your kitchen, comes in. But is it any good? Some people have mentioned that it has pin holes through which compost can leak. Carbon filters have to be replaced. N/A – scraps have to be moved to a regular composter. The Linkyo has been designed to help people make compost indoors with minimal odors escaping. It comes with a lid that fits perfectly, ensuring oxygen can flow and gases can be released. Odors are also stopped thanks to the carbon filters, which also stop fruit flies from nesting. The Linkyo comes with a sturdy handle that makes it easy to carry it to the garden. In fact, the entire bin is very durable, having been made from stainless steel. This also means that it won’t stick out like a sore thumb in your kitchen, as it will look great alongside most of your other appliances. Furthermore, it is very easy to clean the bin once you have used the compost. They have aimed to make living green very easy, and it seems that they have achieved that. It is the perfect solution for keeping all your kitchen scraps, which are then to be added to your regular compost bin or to your chicken coop later on. Because of its stainless steel construction, it does not contain any harmful chemicals, nor will it grow bacteria. It comes with four carbon filters designed to stop odors from escaping. These should last for a year, and replacement filters are easy to purchase. Also, because it is a stainless steel pail, it is not subject to rust or corrosion. This is, in fact, guaranteed by the company, which offers a 100% quality guarantee. 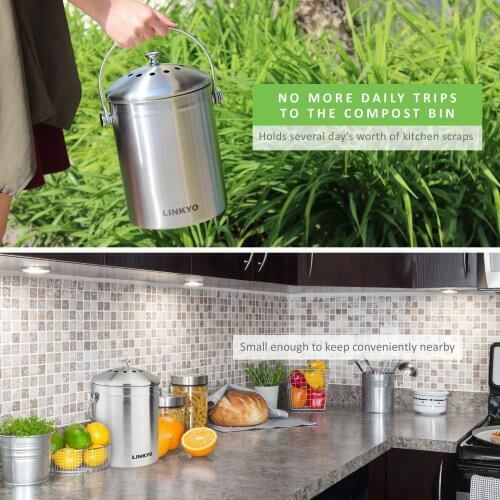 Clearly, the device is designed to make life easier for people, enabling them to collect their kitchen scraps and waste for several days before needing to take it to the outdoor composter. It is free from odor thanks to the charcoal filter, which is designed to trap and absorb odors within the bin. This means the kitchen will always smell clean and fresh. Four filters are included with every purchase, which is enough for a year of composting. Additionally, because it is made from stainless steel rather than plastic, the walls of the bin don’t retain smells. You simply wash the pail every time you empty it, and it will be completely clean again. It is a compact bin, which means it can easily fit even in the smallest kitchens. Many people place it in a pantry or under the kitchen sink if they are short on space, because the handle allows it to be easily taken out. It has a rotating handle included with it, which makes it very easy to take out the scraps and add them to your regular composter or feed them to your chickens without getting your hands dirty. It is completely safe, being made from High Grade 304 Stainless Steel, as well as highly durable. It will not retain odors, as stated, but it also won’t chip, scratch, stain, or rust. The lid fits very snugly on top of the bin. It is not really a composter. Rather, it is a small bin that allows you to collect scraps for a few days that will then have to be transferred to the composter. You have to purchase new carbon filters after about a year. Some people have noticed pin holes in their bin, leading to leakages. Many people choose to also line the bottom of their bin with paper lunch bags or other products to further stop the compost from leaking or odors from escaping. Is The LINKYO Right For Me? This product is a fantastic compost bin that won’t look out of place in any kitchen. It holds around one gallon of kitchen scraps, which most people produce over the course of several days. One of the greatest benefits compared to others is the addition of the carbon filters. These absorb odors and stop leaking, ensuring your kitchen doesn’t start to smell of compost, while at the same time keeping fruit flies, bacteria, and other pests at bay. Unfortunately, the carbon filters won’t last forever and they will need replacing, but you will receive four with your original purchase, enough for one year. The bin itself is made of a high grade stainless steel, which means it is built to last for years. Not just that, it also looks really good, regardless of the type of design you have in your kitchen. In fact, you could simply leave it on the kitchen counter, and it will look great. Many people choose to put it away inside one of their cupboards, however, which works equally well. Because it is so small, it is easy to find space in any convenient area.